The built-in camera of my computer scanning me in its Iris Recognition Software (IRS) winks recognition at me on-screen allowing me to access my computer as I log in. I wink back. Nice to be back in a secure world after spending the afternoon with social activists in non-secured public places where syncretistic anarchists and other germs thrive, not to mention spyware, malware, Worms and Viruses, depending on what you’re toting, if you are analog or digital. I washed my hands with disinfectant as soon as I got home. I tune in to Democracy Now! Ken Blackwell, former Ohio Secretary of State and former Republican National Convention Chair, claimed in an interview in the hallways of the convention in Tampa, the home town of CENTCOM, and my former contractor, Command Languages International (CLI), Mr Blackwater claimed that “…carrying authorized identification cards with photos are an integral part of ‘American Culture’”. That is an appropriate beginning to report to you my latest mind-expanding understandings in the sequence of understandings that were tripped off by the HTS experience and by my subsequent introduction to the Global Anthropology Special Operating Forces Fraternity – GASOFF. 1. The USA is not America, but it is one of fifty nations and colonies within the Americas. Now that is NEWS! Wake up Americans! You are in fact USans, unless you are talking about all of us Americans, including Evo, Raphael, Fidel and Hugo. 2. The USA Incorporated – like all of the ‘corporate culture’ parasites that find nourishment in her intestines – ain’t got no culture. It only has the recently (since 1776) established written and unwritten rules of an authorized official social organization and the right of the government to extract tribute within the territory it rules, with kinetic forces to enforce their dominance, if need be, over the multiple societies within its chosen boundaries, some of which are societies united and guided by genuine culture and the right to bear arms, within its national boundaries: The Nations Within. The corporate expediters, the “undertakers” (entrepreneurs) use the populace as “human capital” or “human resources”. The State government, which is endorsed by – and I mean this literally – those corporate descendants of The Crown and of the Caesars, enforces their corporate right to feed on the populace that way. The Holy See and related European-descended “Protestants” and Jews, which do not Resist nor Protest, provide the sacramental wafers and wine for those who come to heel. And those who do not come to heel are simply ridden over, like the delegates at the 2012 Democratic National Convention who clearly dominated in a voice vote “NO!” against the platform amendment which states that Jerusalem is recognized by the Democratic Party as the undivided capital of Israel. OK, got my GASOFF, now to get down to examining the background assumptions for this essay. My untested hypothesis, really an assumption, based upon the notion that culture is the primary evolutionary adaptation of humans, is that humans will, if left to self-determine, form into societies that will develop a shared cognitive framework that arises from tangible and intangible qualities of that place. That will happen naturally if Empire is removed or backs off; that is what “human nature” is. That seems to follow as the logical conclusion from the shared anthropologic notion that there is some pattern, called “culture”, seeming to be a genetically universal human social trait, that all human societies have benefited from in their struggle to survive, and that seems to be “super-organic”, which Leslie White adapted to his cultural materialism from Krober; words that come excitingly close to Teilhard’s image for the noosphere in which culture is incubated; where a quality called “meaning” resides. But, until now, USans have not developed organic cultures because the people and the landscapes are treated as separate resources, commodities, bought and sold, and where possible, moved to where they can be more profitable to the owners; like the giant Saguaro cactus plants, the mythical ancestors of the Tohono O’odham and Pima Peoples, thousands of whom were dug up from their homes in the desert and taken to “landscape” the yards of plush “developments” or shopping centers in Phoenix and Tucson. So, I would guess – or in Their scientific terms, “hypothesize” – that IF those “jobs”-dependent human capital units of the Empire were able to find seed-money to organize and equip locally productive work that provided the needs of families and communities that controlled their own regional environment in the place they live or choose to make their home because of something in them that resonates, the landscape in which they have long lived or would choose to live because of the draw of the place and the people who are also drawn to that place – “natural selection” we could call it; and, if the “market” came to them and not moved them to the market as both human capital and consumer; then, eventually, in that place, genuine culture would emerge within the stable human society becoming rooted in and reorganized around its growing understanding of that seasonal cycle of landscapes and begin to pulse between the people, the landscape and the other beings of that place, ranging from bullfrogs and their pond on the creek to whirlwinds; from lightning to juniper trees and the fox who makes her home in a hole under the tree’s roots; far from the monuments of the centers of Empire, the people would begin to weave a view from there, a view of the cosmos and The People’s place within. Of course, the context, Earth, has changed. Since the onset of Empire – now apparently more than 12,000 years before the present, the emphasis upon population control methods and technologies has come a long way, Baby! And the number of people dancing in our global plaza on their “day off” has greatly multiplied; exponentially! To reconstruct the social organization and technologies of the time when the genuine cultures self-generated is not possible under the population burden, extensive “private” landscapes and “development” that Empire has wrought all over the earth. It has gone way beyond the parameters of that pre-Empire adaptation. It’s a long way back home, or a lonely cosmos to be settled out there. Strange visions of possible futures while trying to plan from a state of slavery. Perhaps genuine cultures were only dissipative structures in a passing phase of the evolution of human society just before we are subsumed as Transhumans into Teilhard’s Technosphere? Now I was waking up, and it all came back: I had been out for a run with Cheri and the spaniel on an icy morning in 1992, Eugene, Oregon, in the Willamette River Valley of the west of the USA. I woke up when they were trying to get me into an ambulance; having fallen, been knocked unconscious for 15 minutes and sustained a concussion; I kept asking “What happened?” only minutes after they had told me that I had slipped on ice while running down the hill with the spaniel on a leash, that I had fallen and cracked my head on the pavement, again I would ask, “What happened?”, and the paramedic would stare at his feet, and Cheri would glance nervously around for help. “Hey Jesus! How’re ya doin’? My eyes opened as though they were mechanical, activated by the voice that spoke. The young O’odham was both smiling playfully and looking down into my eyes with concern. I could see there were other natives, curious, gathered around me where I lay stretched out on the ground, long lean body in jeans, levi jacket and white shirt, cowboy boots, long red hair and untrimmed beard giving a similarity to the commercial Anglo image of Jesus Christ; only my eyes functioning, staring upward into the deepening purple of the Arizona night sky, into their faces of deep earth-tones fading into the gathering dusk; the earth supporting my completely limp body seeming to pulse, to thump; something under, within the Earth. I was still in the place where I had been seated in the ceremonial circle, just to the east of the two medicine men who sat at the north point; the ceremony was still continuing, the circle still sitting and chanting to the rhythm of the small drum and the shaking gourd rattle playing in the center where two circles danced opposite directions, men and women. I felt completely safe and peaceful on the natural gravel surface, among the rabbit brush and cottonwoods, among the people, the mesquite-smoked clothes, the soft voices. Then, I remembered where I was, and realized that I had been “out”; and while I was out, my mind revisited the Tohono O’odham village of Topawa, and the Saguaro Ceremony where they had mixed loco weed juice with the Saguaro cactus fig wine, the young men ceremonial assistants dipping the cool wine from the boiling baskets with a blue plastic cup and offering it to each person seated around the large circle, saying “Nahuatch!”, “brother”, as they held it toward me..
Wake Up! Johnny, you’re talking in your sleep again. That world has passed on. That anthropology has passed on. Now, I regret to admit that we seem to have gone beyond the resurgence of genuine human cultures as a possibility. Eric Wolf’s “local unity” seems to have been dissolved by Their cultural solvent brought by the capitalist penetration behind the kinetic thrust of their military. The momentum of the Technosphere has ridden roughshod over the Noosphere. Like many of you, I have been wondering how I can continue to be an “anthropologist” if anthropologists no longer do anthropology. Fortunately, I have a retirement pension, for now, and I can do my anthropology any damn way that pleases me; as you can see. Adaptation is the name of the game. We – the USans – seem to have come out of the top of Baboquivari into the next world, Mitt Romney’s and Ayn Rand’s World, RAND’s world. If you say it, and you control the media, then it is true. If you let me be in your dream, I’ll let you be in mine. Recently I am reading discussions about the state and fate of a notion, a way of organizing one’s knowledge within this USan society – a society in which individualism is the ideal and collectivism is frowned upon and sometimes punished – a way of knowledge that is called “anthropology”, as well as well as the related title given to those who participate in the construction of that “discipline” as their “career”. They have called themselves, “anthropologists”. The anthropologists have opined over their state and fate, and their problem of “Who Am I without a Bigelow on the Floor and a Title on the Door? and I am without the throne of a job, now that Anthropology’s Bloom has Burst”. Now this is something I know about! Identity crises. A working class hero is something to be. The other Lenin said that. I find it interesting just how reified and mortalized has become the abstract idea of a field of study called “anthropology” and a related “career” or “profession” and organization of “anthropologists”; as well as a political lobby and a sense of entitlement by those who have attained the apex degree title bestowed upon their legal name, Dr Somebody, Anthropologist. Well, I do profess! Subsequently, some of those are wishing that they had gone for a terminal MBA. Stuck on the Sweet Flypaper of Life, they struggle to find a way to make a decent living with only a PhD in something most people are not quite clear on – “Oh, an anthropologist. … You deal with bones, don’t you?”, and I explain with “Margaret Mead”. Anthropology was a dissipative structure that arose within the feasting of Empire to accomplish certain corporate needs of Empire under the limitations on Empire’s INTEL at that time. It was fueled by Empire’s arrangement, and when the original intent was accomplished and the allotted funds were exhausted or redistributed, it had to morph into something else useful or simply dissipate like the patterns of bubbles rising in the bottom of a pan of boiling water when the water is gone or when the heat is withdrawn. Who needs you? The basic surveys of the “Tribals” globally have been completed. Technological Evolution has moved on: what was “anthropology” has become militarized and remote controlled. Now there are scientific methods of informing the colonial “administration” and Counterinsurgency on the nature of the Human Terrain of the Area of Operation (AO); the original need of Empire that anthropology was created to fill. Anthropology created its own philosophy of human society during the late 19th and early 20th century. But, that is not what Empire needs in 2012. It is currently all about population management and crowd ontrol, not about social philosophy, whether at the Coliseum where The Christians are playing The Lions, or in downtown Boston or Cairo, London or Jerusalem, Oakland or Kabul, Oaxaca or Ouagadougou. And if you control the Federal Budget you can buy any goddam brand of anthropologist you desire; the “anthropologist” brand has morphed to meet the market demand, just like Kool cigarettes. I can’t believe it’s not real butter! I wonder where the yellow went. The magic of Science. Their scientists at RAND and IBM have gotten “culture” all figured out through use of computers. I met them, in their nicely pressed clothes, teaching me “ethnographic methods” at Fort Leavenworth. No more messy, sweaty participant-observation, slapping mosquitoes among the unwashed masses; getting to know the people intimately, learning to navigate their culture. Now there are multi-media drones, armed or unarmed, equipped with sight, hearing, radiation-detection, magnetic and sonic resonance mapping and perhaps smell recognition along with face-recognition programs to identify suspected Bad Guys, mass communications screening and pattern recognition analyses performed on Central Processing Units programmed by anthropology Ph.Ds at RAND (Corporation, not Ayn Rand, but same team). Bad Guy identification is done through the process of elimination, after social network analysis is completed and media releases approved before the killing is done out on Highway Fifty-One. I mean, of course Anthropology is not part of Western European Empire’s “Science” – although Boas, a Wesphalian, the cited root source of USan Anthropology, did earn his PhD in physics from U of Kiel – but it is learning to dress like Science and talk like Science, and earn its pay from the Military Financial Complex (MFC) by walking like Science, in lock-step with policy and doctrine; another human capital tool of Empire. I saw that tawdry scene up close. In other words, the anthropology of the military financial complex (MFC) is not anthropology at all. Genuine anthropology, especially ethnography/ethnology, is not a science, but a combination of humanities and arts perspectives wrapped into the concept of Culture as its organizing concept and “a culture” as its elementary unit of study, the key evolutionary trait to divergent human societal development in response to the nature of their particular place in the earth’s ecosystem. The approach of the genuine anthropologist (that’s me, in case you hadn’t got it yet; the last living anthropologist in New York City) is to understand how the people of that society see their own society within their own worldview, their (forgive me) “separate reality”. This approach is informed by biology, geology/geography, history, psychology, linguistics and the sociology of diverse human societies and the recognition that each society has a unique code, it’s own syntax of parsed meanings, a unified program for constructing a context and constructing guidelines for living in their perceived reality that comes with its own rules for relating within and to that world – their culture. This is the rationalization of cultural relativism that Franz Boas and Edward Sapir founded; and, in your “heart”, you know that “their” world, the world of the Other’s society is real but not translatable to your own world’s idiom – the problem of solipsism. So, you use poetic metaphor, trying to touch keys in your own psychic makeup; words that elicit in yourself that which you want your “ethnography” to elicit, in the minds of one’s own society, about these people’s world, to help them to understand that Other’s world. An art, not a science. One is describing one’s own perceptions of the collective, corporate Other, and triangulating with how the Other sees the observer. Social organizational rules and laws do not a culture make. Since you have to see it from the inside of the mind of the Other, Rome’s “science” that views Other as object misses the central landing approach to understanding other peoples’ cognitive realities; their deep and separate realities that we call “cultures”, organically grown cultures. Genuine anthropology is more like a séance than like a science. It requires a tuning-in to the Others’ worldview, to intangibles the Other experiences, which is difficult to “replicate” because it links two different syntaxes of consciousness in the physical-emotional-spiritual world: one’s own and that of the Other. One is trying to comprehensively understand the perceived reality of the Other in communication with an Other or Others. What could be more subjective? A poetic sensibility is a fundamental tool of the ethnographer in the field. The anthropologists approach the problem of description/hypothesis through participant observation within the cycles of routines set by those societies in their fundamental social units of community and family. To observe from the cognitive “inside” view of the world in which they and I live for that time. To be mentored by them in their own sciences, cosmology and history; aesthetics and ethics until that something clicks over to that “Ah Hah!” experience of the ethnographer finally synthesizing that way of seeing the whole of reality from that worldview. Then, the ethnographer has to represent what one understands from one’s informed peek into Other’s own language-culture world; to represent this in a translation into one’s own USan language and cultureless USan world. A science? Of course not! Educated and informed by familiarity with many sciences of many societies; but, anthropoolgy, in genteral, and ethnography in particular, is not a science Some of the best ethnographers working today are novelists, such as Joan Didion in her autobiographic study of her own people “settling” California, Where I was From; and Russell Banks, in his The Book of Jamaica. Still there are some such as Roberto Gonzalez who are practicing the current edition of the Berkeley School’s genuine anthropology, and, at the same time being aware of “his” people’s context in the global setting, as in his Zapotec Science. Although emphasizing the use of methods and techniques that are essentially, coldly “objective, empirical physical science”, and though informing itself from many sciences, cultural anthropology along with anthropological linguistics, archaeology and biological anthropology has long been understood by a marginalized group of anthropologists – GASOFF – to be primarily a tool of Empire used to target and to understand how to approach the Human Terrain of current and prospective colonies; to inform The Mission and misinform the People, both in the AO and in our own country. Anthropology has served to guide the colonial rulers on how to draw their colony’s and new “nation states’“ boundaries to serve Empire’s tactical advantage; and to arrogantly describe for the Others their own histories and to draw those peoples into the global culture-stripping “education” and employment by the Empire, such as anthropologist George Foster’s advice to rid the villages of burdensome “ceremony” and “ritual” – aspects of their culture, so they have more money to spend in the global market. This truth can be seen in anthropology’s mirrors for anthropology, from Skull Wars to Kathleen Gough and David Aberle to David Price makes that glare brilliantly. However anthropology does allow a creative fringe of possibly useful and beautiful research ventures for scientifically informed, humanistic and artistic explorations into other cultural realities, funding and enabling those who are native – the Other – to represent their own worldview and opinions on global events, historic and current. And Empire has culled through these ethnographic reports for hints on how they can be used to expedite conquest and crowd management, or post-modern “culture”. Out of this skewed scanning of the information that is done at the HTS’s Reachback Research Centers at Fort Leavenworth, Kansas and at Oyster Point, Virginia, the quest for a path to exploit legitimate ethnography has come down, far down, into this contractor’s (remember BAE?, here they are again, or still) current version of the Human Terrain System combined PsyOps and INTEL operations. During the later Roman Empire, the term “civitas” was applied not only to friendly native tribes and their towns but also to local government divisions in peaceful provinces that carried out civil administration. Land destined to become a civitas, once it was “cleared and held”, was officially divided up, some being granted to the locals and some being owned by the newly imposed “civil” government. A basic street grid would be surveyed in but the development of the civitas from there was left to the inhabitants although occasional imperial grants for new public buildings would be made. The civitates were regional market towns complete with a basilica and forum complex – a pre-packaged symbolic landscape of monumental centers of authority – providing an administrative and economic focus. Civitates had a primary purpose of stimulating the local economy in order to raise taxes and produce raw materials. All this activity was administered by an ordo or curia, a civitas council consisting of men of sufficient social rank to be able to stand for public office. [ http://en.wikipedia.org/wiki/Civitas ]. There is a body of literature discussing the fact that many field ethnographers who really participated in their subject society saw a distinct difference between those societies in which Sapir saw “genuine culture”, that were relatively independent of empire and had long histories in their own landscapes and, on the other hand, those societies, such as the USA and most of the former colonial lands of the Roman-originated Empire with the engineered, exploitive social organization that Sapir calls “spurious culture”. With this set of imported formal and informal rules and laws (the spurious “culture”) and the backing of the military and church, the invaders mob the indigenous peoples’ lands, which became swamped by CentCom-engineered and empire-stimulated migrations of already displaced or dispossessed European peoples seeking a “new life” or a “gold rush” in the New World, the Settlers, again. John Trudell, the Native American folk singer, launching into song, .. I’m sure I heard him singing This is Stolen Land; don’t you know me? I’m your Native Son, still standing at the margins, watching as the new generation of “immigrants” floods into their homelands. Since 1900, the entire world has flooded into the Americas; into the USA if possible. This was sharply illustrated by the video surveying those arriving during our historic period, late in the Neolithic, that we call “post-modern” or “post-industrial”. The video (I and II), The New Americans (2007) documents the processes of US attempts at “civilizing” of these current immigrants, in case studies from Palestine, from Nigeria (Ogoni), from Dominican Republic, from Mexico. All of them being descendants of other empires’ colonies, the native peoples of that place, they are savvy of the reality of their situation, blown out of their own lands with the winds of settlement, now they are the New Settlers. Personally, I think there is some reconciling to be done between those “traits” that make a society a “civilization”, and those traits that lead to a person’s or a society’s behavior being classed as “civil”; not requiring that we stick with original Latin etymology. V Gordon Childe was not concerned with civility, he was concerned with technology and social organization; as these become more complex and much larger, we approach his and many’s definition of “civilization”. It is a place where we will all arrive one day, sort of like the Mormons’ “Cielestial” Kingdom. It is in the Celestial Kingdom that you will finally obtain your Pie in the Sky; if you’ve earned it. One should see that the very inception of the US Bureau of Ethnology (called the “American” Bureau of Ethnology) under Lt. Col John Wesley Powell, was a new sort of mission, a different sort of assignment; the next stage of the Empire’s Progress. Powell had lost his right arm to a cannon ball while serving the Union Army in the final battles of the US Civil War – which was really about which type of social organization that the USA would enforce and the choice of an industrial or an agricultural emphasis to the economy. The Civil War had settled that. So, with that part of “civil” settled, Lt Col Powell led the main expeditionary force on the Way Forward. The military and their private contractors, like BAE, was now to go on an INTEL operation into the areas targeted for expansion and settlement, roughly, off the top of my head, the territory between Fort Leavenworth on the Missouri River, Fort Sam Huston – known then as The Alamo, down near the Gulf of Mexico – and Fort Vancouver, Sutter’s Fort and Los Angeles on the Pacific Coast. He was to study the Human Terrain as well as the biologic, geographic and geologic terrain and its potential resources with an eye to planning and profiting from the “settlement”: paths for rail and road and profitable “development” (conversion into commodity with owners and deeds) of these lands now occupied only by “Indians”. In fact, much of those lands had been called “Indian Territory” in the treaties; but only until it was time for the next quantum of Civilization, of Expansion of the US into the rest of America; all of The Americas. Meanwhile, an insurgency has developed among anthropologists, powered by GASOFF, that is leading the civilians and anthropology toward the horizon of a New Society! More on that later. That Powell expedition, like those of the great Ceasars, needed certain skills to meet a need during this stage of the process of conquest and “civilizing” – creating civitas with forum and basilica for the subjected indigenous peoples of this newly acquired real estate; while mapping the resources and making recommendations for such infrastructures as rail and road ways for rapid deployment of troops, chariots and supplies, canals and pipes to carry water to dry soils or to cities planned to be built around factories and farms. They were laying the foundation for the “settlement” of lands of other tribes and other civilizations. They were also laying the foundation for “American Anthropology” and its investment in Heritage Management and cultural tourism. Franz Boas, in both his West Coast and his East Coast lineages started with entanglement in the leveraging of “seed” capital and with “national security” interests with academic function, this funding and the beginning of a longer-term archaeologic and ethnographic “salvage research” funding – we’ll save your culture in our writing and in our museums, then we’ll tell you who you were and your scientific history – and a program to transfer the artifacts and archives from the Powell Expedition to the newly founded and funded Smithsonian Institution. The Smithsonian, and a number of private and subsidized university museums arose, such as the Peabody and the museum at Berkeley, which required funding for staffing, funding for training “anthropologists” for faculty, both teaching and research and for “curating” the museum collections that ranged from skulls to crowns, anthropological bounty that had been stolen up until that time. So, a “profession” of anthropologist began to have a sense of entitlement in such places as California, where the tuition for students was almost free and the entrire population paid taxes to support the entire educatinnal system that supplied ite educational needs; and to construct a creation myth and curriculum vitae. During the post-WWII years when some of the fat of the US prosperity was still flowing to the People, students such as me – a poor boy from the southern San Joaquin cotton fields, taking his first course in Anthropology, upper division “Ethnology”, seduced by the wide-ranging, erudite lectures and cosmopolitan image of the slender and debonair recent Cornell Ph.D., Jaguar-driving, umbrella-toting, leather-elbowed Harris Tweed jacket-wearing, meerschaum pipe-smoking Department Chair and its only faculty member at the University of California in Davis – took an interest in the exotic field of anthropology as a “career”; having no inkling of the origins of “anthropology” nor of the future of the US economy and its changing link to education and the over-riding military-industrial complex. Anthropology was very interesting to me. Coming out of the background of cotton-picking poverty, but with high-falutin ideas, I wanted to be like David Olmsted. When I returned from Korea to finish my BA, I changed my major from Pre-Veterinary Medicine to Anthropology in a department that had now added Martin Baumhoff, a UC Berkeley PhD with field experience in Egyptian archaeology and now a recognized leader in California Indian “prehistory”; and soon to continue growing with Alan Coult, who founded the section in the AAA for Psychedelic Anthropology, and then a young bioanthropologist by name of Whitehead, and so on. It was the blooming, the boom before the bust of the anthropology dream bubble. Born in New York , he entered Stanford University and received a BA in Psychology, after which he traveled to New Zealand to study Maori music. Then he decided to study anthropology at Berkeley University (sic!) where he was trained by Alfred Kroeber, Robert Lowie and Melville Jacobs….. He went on to do postdoctoral work in linguistics at Yale University with Edward Sapir, … Among his graduate students at Indiana were Ken Hale and Dell Hymes. Later he was at the University of Hawai’i, before returning to Indiana as an emeritus professor. His collection of papers are held by the American Philosophical Society. Those things I knew. The next I did not know until now. I was quite surprised to learn this, when, only recently I had speculated that it was at the time of the takeover of the department chair from Voegelin, a coup by the newer generation faculty, that the MFC moved in with their own super-PAC of the time, to change the department to produce what the military needs. Now I find that it was Voegelin himself who had plugged into the military’s need for “strategic” languages not taught at most universities. And of course, Voegelin was instrumental in the selection of the second generation of department faculty at IU. It was the IU administration who chose Voegelin, and chose to participate in the American Universities Field Staff that had funded Dupree’s 25 years as resident researcher and CIA operative for Afghanistan and the Midwestern Universities Consortium in International Affairs that funded my own doctoral thesis research with Dupree as my “in-country host”. With the Army’s help Voegelin could pursue his own pure research in the study of unwritten languages. Same for Dupree, even better! as he admitted, the description of his position made even Dupree “suspicious”. There was no apparent ethical conflict. It was all about having and keeping a job using available funding. Everything seemed okey dokey to me; but, I hadn’t put it all together at that time; perhaps compartmentalizing to avoid seeing evil? And I believe that Carl Voegelin, to whom I owe a lot, never intentionally contributed to anything other than his own research interests, self-designed, except, perhaps, to to incubate those who produced the manuals and to provide recommended versions of instructional manuals for the sound, syntax, and style analyses of such unwritten languages as Pashto, local Arabic dialects, Vietnamese and Cambodian tribal languages, East Timorese Tetum.. I wouldn’t dream any harm could come from his work. But, the military can find a use for things; being as thorough as possible in preparing for a Mission; with lots of money to pay unemployed linguists and social scientists; they will have a comprehensive, objective inventory of any society they are planning an Operation to bring Freedom and Democracy to. In my classification system, these are not Bad Guys; but they might be running with a Bad Crowd without really understanding the long-range potential for harm to others, or, in some cases, like Dupree, they felt that it was the right thing to do; aiding a “higher cause”; just like my Ulpan teacher at Kibbutz Dafna, in the upper Galilee Valley of Palestine in 1964, when I questioned the morality of the Zionist takeover, he said that the Arabs were not using the land to its “highest potential”, and they deserved to be replaced for that reason as well as because the Bible (Theodore Herzl’s interpretation) tells them that it is God’s Plan that the European Jews who have intentionally lived in Europe for thousands of year should form an army and colonize Arabia. And, besides, continues the Rabbi from the then apartheid South Africa, that was no different than what the US had done to the Indians. What could I say? I’m sure I found something to say to him in response. So, if you are really committed to being an “anthropologist”, the US Army has a role in their social organization – their “culture” – for you; a job that pays well. “Anthropologist” is a place where The Empire can hide weapons of the intelligence wars. Sort of like being a drug runner, but legit! If one is ignorant of the potential for harm from their actions, all the mo bettah! I have had some recent in-depth education in the Counterinsurgency strategy through which I now filter current events and the language of “news”. As you all noticed at the Republican National Convention, the gloves are off; the powerful feel threatened and have pushed We the People back away from Their fortresses with force, the US military is Their own and feels gratitude to Them for all the money that They have funneled to the War, as They sit in Their private deluxe box apartments with Their politician guests, watching the convention from the same distance as the Roman elite watched The Lions “play” The Christians – which latter the team owners later adopted as its logo and mascot. The Christians are all cheering, the Lions are circling. This is NOT a good time to go running up to the Koch brothers or Sheldon Adelson with flowers and songs of peace and love, or serious questions about their ethics, as Amy Goodman found out. Any formal group found communicating with The Bad Guys on the internet or by telephone can be classified on the Counterinsurgency list of possible threats to national security, and, at a moment’s notice at any time that the US Military and President want to call an emergency, those groups will be “detained”, or worse. Really, it’s nothing personal, when they vaporize you with a drone missile. Not at all. It is purely scientific. Determining whether a group or a person is a potential security risk is not done by knowing you personally. It is done by men and women with PhDs in anthropology and other “social sciences”, but who, functionally, are Army-contracted statistical sociologists and computer programmers in Leavenworth Kansas and in Oyster Point, Virginia , analyzing abstractions from trillions of digital messages, such as the people you associate with – your “network”, and its “key contacts” collected both in the US and in such places as Menwith Hill, Yorkshire, England. These bases collect data; anthropologists are on the teams that analyze it. 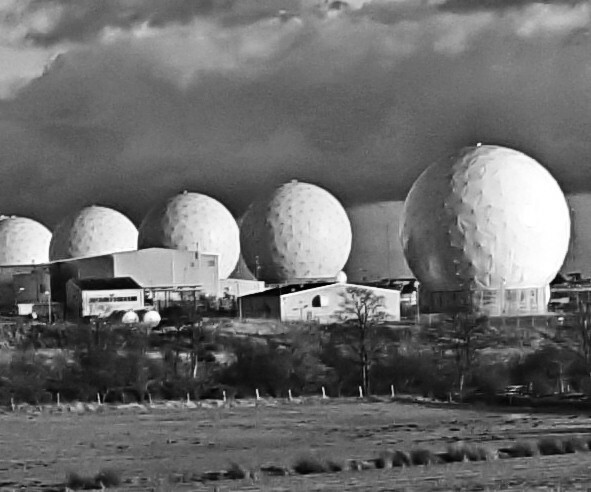 The site acts as a ground station for a number of satellites operated by the US National Reconnaissance Office, on behalf of the US National Security Agency, with antennae contained in a large number of highly distinctive white radomes, and is alleged to be an element of the ECHELON system. The majority of support services are provided by the United States Air Force, 421st Air Base Group. One of these US soldiers lives next door to my friend, in Harrogate. He gets up early each morning and drives to work at Menwith Hill. . She says he is a nice guy, like I am, like Voegelin was and Dupree was; all a matter of degree of our involvement. On the other hand, Kathleen is deeply engaged with an environmental group in trying to rid her native landscape of “invasive species”; and here is a difficult one to get rid of. She has protested the occupation of Yorkshire’s hills and dales by the US Army’s imported sci-fi landscape and “intelligence” weapons. I protest it too. So should you. In March 2012 researcher Dr Steve Schofield produced a 65-page report called “Lifting the Lid on Menwith Hill”, funded by the and published by . The report revealed the base was “being expanded in a multimillion-pound programme” and becoming “increasingly vital to US intelligence and military operations”. Based upon the data collected here and analyzed by USans, if you happened to be in the same place as a “known terrorist” at the same time, for example, that can be used in determining “who you are”, your ID, stated in their COIN terms. You see, COIN does not have “identity crises”. If they decide you are a Bad Guy, it will come back to bite you. It can be something so simple as a job application at a university, or a government job; or it can be something more terminal, like a drone strike. The networks of the competing forces within this society pervade all its institutions’ functioning. Sooner, or later, hamdullah, it will come back to bite Them, insha Allah. Standing, reasonably, outside the assumption of being able to substantively influence the stream that I am swimming in, I begin to look at other prospects and perspects. How can I find personal peace and come to terms with the world that I must engage, yet, not hide inside quietism? If I cannot be helpful, at least let me do no harm in my own version of activism. We pray for Peace in all the worlds. We pray that Evil may be overcome by Good. We pray for an end to all disaster. Nice virus…one little line in your long essay, and it has me spinning records. On a day dedicated to state-orchestrated, mass mediated, and individually wilful amnesia in the U.S., it’s great to see how this site can act as a “memory lane”. Yes, I agree; it is good to be playful along the way to whereever we are going. I enjoy your playful serious Resistance, Max. Lulzing at the spy-will-fly quip myself, but John brings up a serious guilt-point for me, early on in the piece. I’ve long used the terms “America,” “American” and “Americans” as a sloppy synonym for the US in terms of both state and nation – before and after becoming aware of the conceit and inaccuracy entailed in such usage. I’ve tried to justify it in my mind in various ways, including a half-hearted attempt at thinking that it’s a good idea to take a word so often associated with mythological unadulterated goodness and associate it with a broader reality that includes the bad and the ugly. But truth be told it’s mainly writerly laziness and lack of creativity. Somehow “USans” doesn’t cut it for me either (“Yankee” is out due to massive internal baggage). It’s not that I think the convenience of prose should take precedence over politics, but that I think we could do better, and I suspect someone already has; I’m just ignorant of it. This essay was a bit gut-wrenching for me. It was all “true” in the sense of being the subjective reality of the author, but I would like to question the one aspect. This as the bit about anthropology not being science. I have done ethnography; I did altogether seven years in the field, living with foragers (Kalahari), and with pastoral and farming peoples of varying land use intensities, in West Africa. I understand the vitality of participant observation and the experience of slipping cognitively under the skin of another cultural system. But i also think this is just cognitive escapism unless it is balanced by a search for causal explanations about the adaptation of the culture to its environment. Causal explanation from within the system tend to quasi-religious and folklore: causal explanations that anthropologists seek are one that help us compare different cultures and develop broader models of how human cultures are adaptations to environments (including other cultures). So the kind of causal explanations we draw upon are pan-human, and of necessity, evolutionary and comparative. They are hypotheses intended to be be tested by systematic collection of data. Things like field sizes, exact species of plants grown and in which soils, cycles of cultivation, work effort per person as a function of the dependency ratio… are all data worth collecting, as are the heights and weights of people, their birth rates, their mortality and mobility at various ages, and so on. These data should if possible be related to the long term information we have on each culture, not just from folklore but from archaeological sites. Linguistic data also is not just the intimate and immediate internal window into the cultural Zeitgeist but also a window into the way linguistic systems evolve cognitive and perceptual programs uniquely suited to particular times and places within the cultural landscape. As for the business of being co-opted to become a branch of military intelligence, could there be a way of using these kinds of jobs to do some fieldwork on the organization of the military-industrial complex as a cultural form, getting into it’s ideology, institutions, and economics ANALYTICALLY and then developing a data collection to test hypothesis about how systems of this kind evolve, and -perhaps – what their vulnerabilities might be. The system of empire will collapse, along with the whole of the industrial global economy. That is inevitable now, the only question is whether the fall will be sudden and complete or piecemeal and staggered. Above all, the complex is dependent upon huge amounts of energy and money. This dependency can be mapped based on data already in the public domain. How likely is this system to survive long after the financial markets fall, and the frantic efforts to shore up oil supplies by increasingly risky and costly means eventually hit the point where they are energy sinks? If ever there were an interesting time to be an anthropologist, it is now. We don’t have to be “co-opted” – in fact a true anthropologist cannot be, as we always, first and foremost, observers and outsiders, whose aim is understanding rather than personal gain. How many empires have collapsed fully documented by anthropologists? Think of all the things we can learn! Thanks, Helga, for a very well-considered critique. I agree with almost all of your points. It is just that your perspective and mine are different. You look at it all comparatively to generalize on the universal patterns; the cultural eveolutionary frame.. I try to see the comparison from the perspective, the cultural worldview of the people; mentored by them. They will each be different, and can’t really be reduced because they are part of a different paradigm. Helga, one more thing to clarify: If there were going to be a universal scheme for human cultural evolution, would it be your culture’s, or that of another culture, like the Pashtun, the Navajo or the Cubans. Whose cultural framework, whose science, whose worldview would be the determining order of the universe in the universal evfolutionary scheme. What would be the important variables that are diagnostic of someone’s criteria of degrees of evolution? John, thank you for this reflexive tour through your memory bundles and for the vignettes of your experiences with institutional anthropology smack in the middle of the Cold War blistering sauna through the lens of the American imperial rage and its supporters in the “Science of Culture”. You are very generous in absolving people like Dupree and Voegelin from membership in the “Bad Crowd”. I am not that informed about Voegelin; but given his pre-and post-1978s activities, Louis Dupree was a dedicated mascot, coach, and athletic director for the anti-communist Yankees (posing as an anthropologist)in Central and South Asia. Was the “Midwestern Universities Consortium in International Affairs” the forerunner or successor of the American Universities Field Staff? Or is MUCIF actually AUFS? Western scholarship about Afghanistan over the past sixty years in general and the Euro-American ethnographic writings about Afghanistan in particular would be enriched if you could elaborate on the role of Louis Dupree as the “in-house host” of Western established and aspiring scholars in Afghanistan. It would be so helpful if you could provide full details of the historical and political context of your journey with Dupree to Aq Kupruk and his role in helping construct the context of your visit to Nuristan and your extended stay in Kabul. In laying out this context it would be quite helpful if you could recall the political and social conditions in Kabul during 1970 that caused your abrupt departure to India and to trust precious packages of your field data to Louis Dupree. Well, Jamil-jan, you and I could have great fun batting this ball back and forth; I like your energetic and gentle approach. However, you not only play hardball, you have your act together and your homework done and reflected upon for so long it is ready to leap! If God is willing, maybe someday I will get my act together, get all my goats to follow the Billy, but, as you can see, my writing is more like herding cats. The truth is, I was both so naiive – especially considering that I had previously been “around the block”: the military in Korea, Peace Corps in West Africa, bumming about Europe, and then the year in that European Zionist colony in Arabia, specifically displacing the Palestinians from their own lands – so I am surprised at my own naivite’.And, since the proposal was initially written with the intent of going into Nepal, and only switched to Afghanistan at the last moment due to Berreman revealing the CIA/anthropology merging on the Nepal/Tibet dorder, I really had NOT done my homework or reflected upon Afghanistan. As you know, in 1969, there was not really a developed field of Afghanisan Studies; and nothing at all on Afghanistan at most Universities; as at Indiana. Given this lack of preparation, and having just taken the money and “gone for it”, not even knowing where “it” was, I trusted Dupree because I was really dependent upon his advice and help, and letters and such. I remember that much. Carrying his letters of recommendation and explanation in Dari to the offices of government and sitting all day in e big stone buildings with marble all about; watching the young adult children of the privileged sitting at their desks piled high with stacks of papers to be processed while they, and I, took tea again and again from the very nice older gentleman, dressed in a vest and western clothes, carrying the silver tray with the pot and fine china cups and nice little white sugar cubes; while the young “clerks” threw wads of paper at each other, then took a break; perfect English bureaucracy – now that is technology transference! I do think that Midwestern Universities Consortium in International Affairs – MUCIA – was simply a cover for DoD funding; and American Universities Field Staff got paid by the same funding, but, conventiently thinking ahead, keeping separate line items to appear unrelated. I mean, Bad Guys are not necessarily Dumb Guys; just ignorant of karma. Without my fieldnotes, and only “creative” writings and photos that we brought back with us, it seems unlikely that I can reconstruct much; I mean, how could I analyze social conditions; I had no context. As far as clear memory of events and names and places in 1969 … (As you know, those who were part of the sixties don’t remember them.) However, when you ask me for such detail, I do think on it and try to “reconstruct”. But, as you might have noticed from some of the recently re-aquired photos that I took then, without my notes, I am asking YOU if this is the ruins at Aq Kupruk in the photo, and if that is the Paghman Palace, or such things. I’m working on it. It’s in the mail. Of course it is not really news for me (although some of it is), but with the way you put it, and in connection with the whole essay, a shudder ran up my spine when I got to the part where the drone-strikes are scientific. And then a sentence I read only a few days ago came to mind : “What has been done is the greatest achievement of organized science in history. ” This the US President in an official statement, and the date is August 6, 1945. Thank you very much John for this essay. I am currently going over the Aq Kupruk ethnographic package of films for possible use in my anthropology course about the Middle East. Perhaps for that reason my keyboard mistakenly placed you there. My mistake. I did not mean Aq Kupruk. I meant your June-August 1969 journey with LD to Maimana and excavations at “ghar-e luli”. Where were the results of this excavation published? I am deeply sorry if I have come across as an “interrogator”. I meant to respectfully solicit ethnographic and historical information. I do not think of you as interrogator. My lack of civil restrain from joking familiarity sometimes is misunderstood. I have no doubt you understand the gap across which you and I communicate here in the Public Plaza. I am sure the Ghar Lul’i excavations near Maimana could be found by searching. Not being an archaeologist, I didn’t really care. I was and am interested in the living culture, like Jamil. I had sent to you and to your son a photo from the Dupree trip, asking if it was the Aq Kupruk ruins.